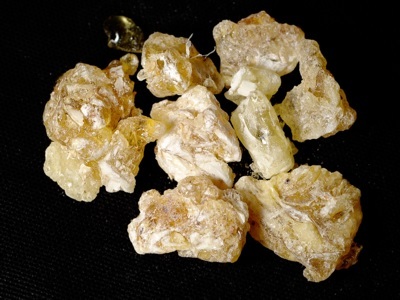 Frankincense (also known as Olibanum) is an aromatic resin obtained from trees of the genus Boswellia that has been harvested since ancient times (for at least 5000 years). Frankincense is used in incense and perfumes. The Gospel of Matthew tells us that Frankincense was one of the gifts brought to the infant Jesus by the Magi (the other gifts being gold and myrrh). Frankincense can be interpreted as both a gift fit for a king (as perfume), and as a symbol of divine authority (as incense).